Prior to the scrapping of the 1935 Constitution, presidents would deliver their State of the Nation Address in January, at the Legislative Building in Manila. 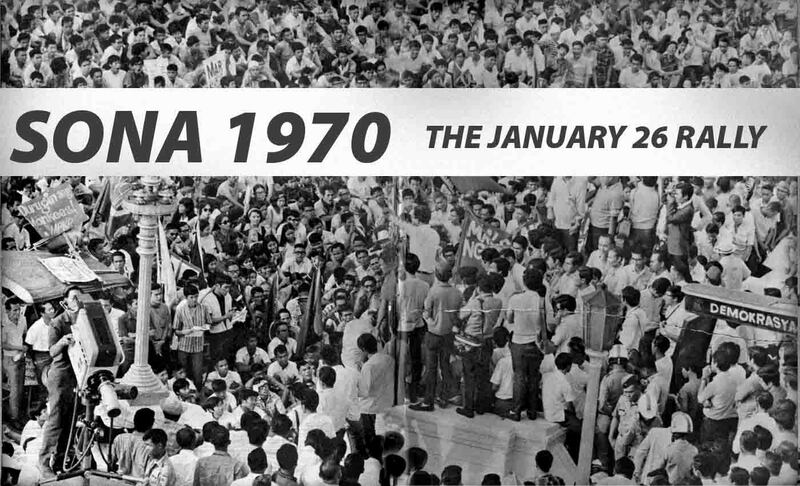 On January 26, 1970, President Marcos, who had been inaugurated for an unprecedented full second term less than a month earlier, on December 30, 1969 (see Pete Lacaba’s satirical account, Second Mandate: January 10, 1970), was set to deliver his fifth message to the nation. The classic account of the start of what has come to be known as the First Quarter Storm is Pete Lacaba’s The January 26 Confrontation: A Highly Personal Account, February 7, 1970 followed by his And the January 30 Insurrection, February 7, 1970. From another point of view, there is Kerima Polotan’s The Long Week, February 7, 1970. Followed by Nap Rama’s Have rock, will demonstrate, March 7, 1970. And there, is of course, the view of Ferdinand E. Marcos himself. January 23, 1970 and January 24, 1970 were mainly about keeping an eye out on coup plots and the opposition, as well as reshuffling the top brass of the armed forces and picking a new Secretary of National Defense. January 25, 1970 was about expressing his ire over the behavior of student leaders. If we do not prepare measures of counter-action, they will not only succeed in assassinating me but in taking over the government. So we must perfect our emergency plan. On January 29, 1970 Marcos rather angrily recounted receiving a delegation of faculty from his alma mater, the University of the Philippines; and reports in his diary that a very big student protest is due the next day. …the Metrocom under Col. Ordoñez and Aguilar after reinforcement by one company of the PC under Gen. Raval arrived have pushed up to Mendiola near San Beda where the MPD were held in reserve. I hear shooting and I am told that the MPD have been firing in the air. For an overview of the events of that day, see Pete Lacaba’s And the January 30 Insurrection, February 7, 1970. This was another in what would turn out to be historic reportage on historic times; as counterpoint (from a point of view far from enamored of the students) see Kerima Polotan’s account mentioned above. The next day, January 31, 1972, Marcos further fleshed out his version of the student attack on the Palace, and begins enumerating more people to keep an eye on –politicians, media people; he also mentions the need to suspend the Writ of Habeas Corpus –eventually. For an overview of the First Quarter Storm, see also Manuel L. Quezon III’s The Defiant Era, January 30, 2010.